The central information point of ZigZagCity settles in the Wijkpark Oude Westen. 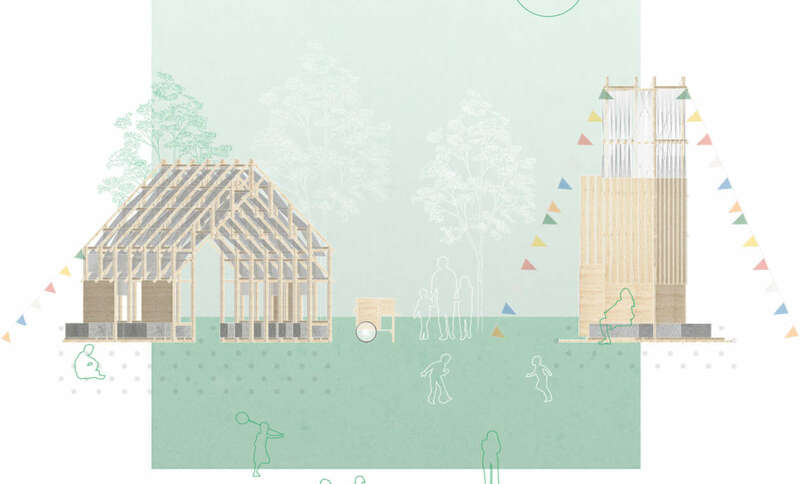 Especially for the festival, 15 international students from TU Delft have designed a pavilion. It forms a festive 'public interior' in the park, a place where people can meet and exchange their stories. The pavilion is the ideal starting point for your discovery through the neighbourhood . The festival pavilion consists of two parts: the House and the Tower. The skyline of Rotterdam is the inspiration, with the towers that rise behind the gabled roofs of houses. The tower here marks the festival location, the house stands for the interior, a homely place where visitors and neighbours can linger in the Wijkpark. Students: Bjorn van Dijk, Camilla Ceccacci, Dennis Dennis Musalim, Emilia Golebiewska, Eunkyu Hong, Eva ten Velden, Jack Petch, Junyi Zuo, Linn Opsahl, Mary Lou van den Berg, Matthew Riches, Nikolas Kourtis, Samuel Goma Garcia-Ganges, Sebastiaan Brouwer, Trang Phan. ZigZagCity festival pavilion at the Wijkpark Oude Westen is open from Thursday to Sunday, 11:00 - 18:00.